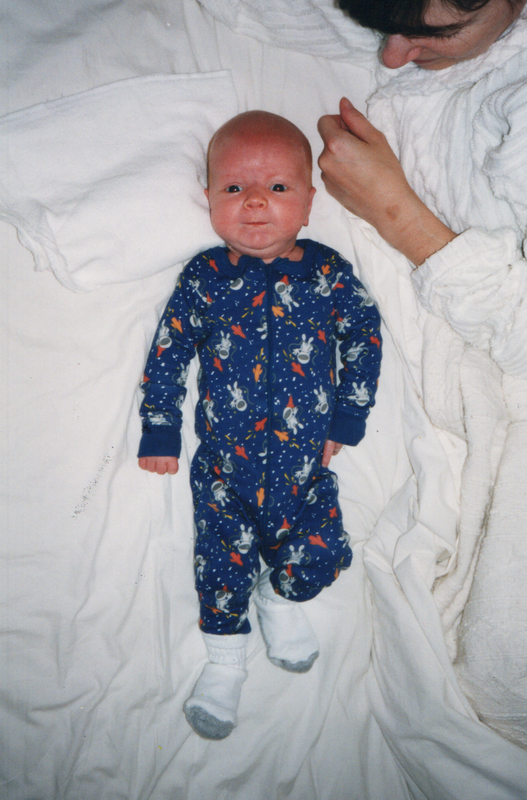 I couldn’t let Mother’s Day go by this year without mentioning Gray, my only child, who happens also to be my occasional co-conspirator in the realm of book illustration. 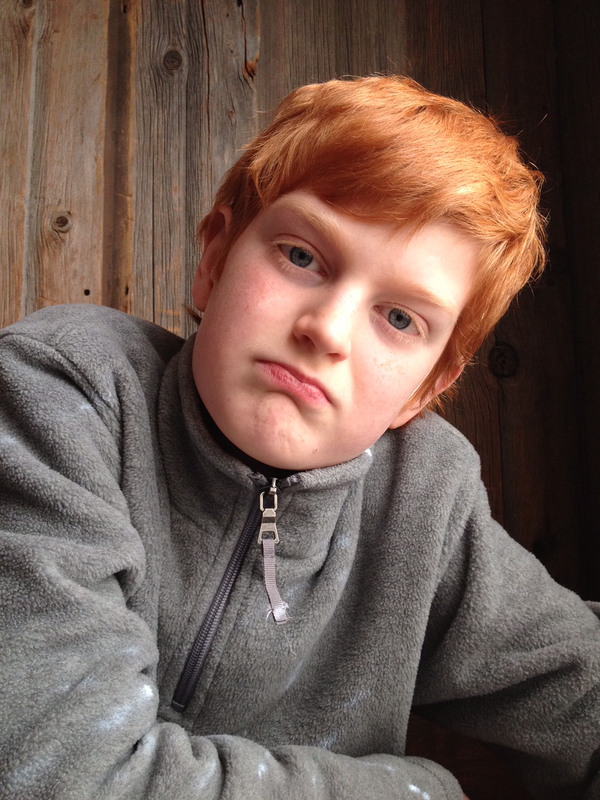 This ginger fellow may be taller than me now, but is barely a teenager—he turned thirteen last fall, just a few months after he contributed drawings to one of my latest book endeavors, duopress‘s 100 PABLO PICASSOS. 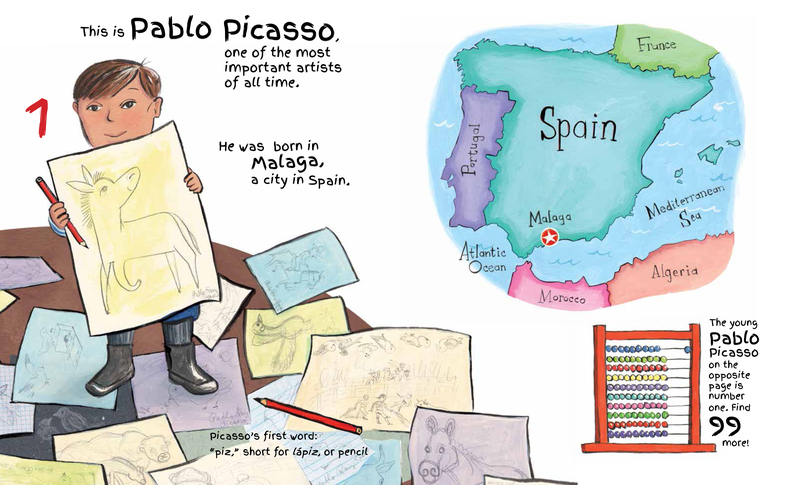 Summarizing the incredible life of Pablo Picasso for a 32-page children’s book would be a difficult task for anyone, but author Mauricio Velázquez de León made it look easy. 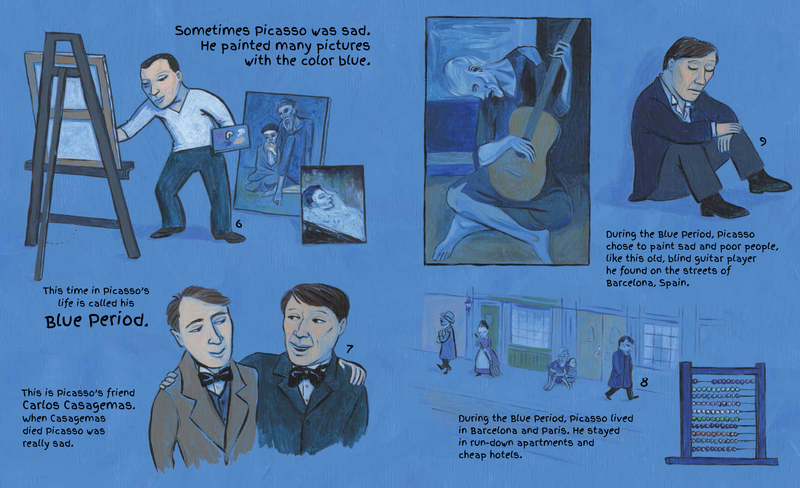 There are 14 two-page spreads in the book, each devoted to a different topic: Picasso’s Blue Period (above), his Rose Period, the years he spent chumming with the likes of Max Jacob and Henri Matisse in Gertrude Stein’s studio (below), etc. The first spread in 100 PABLO PICASSOS is devoted to the artist’s early life—and this is where Gray comes in. Gray is an amazing artist—he made the above sketch, which is such a tiny sample of his overall body of work that it is laughable. In my house, storage tubs filled with thirteen years of this kind of thing are stuck in every closet and under every bed. 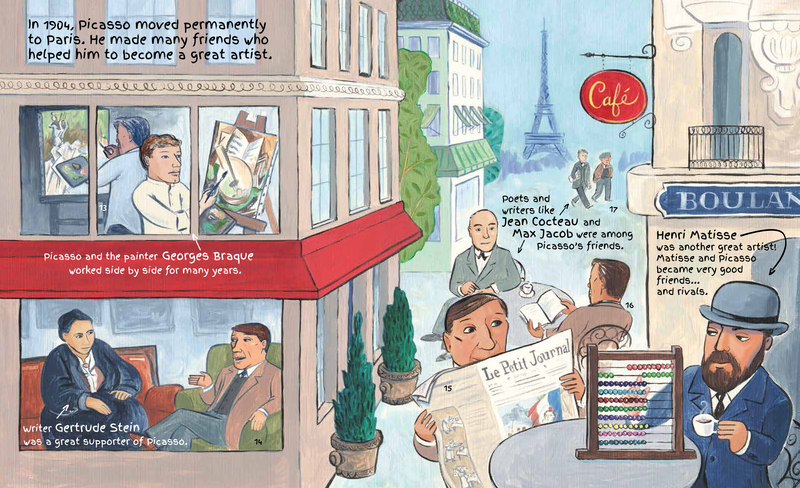 Because of my son’s particular interest in architecture, duopress contracted then-nine-year-old Gray to doodle some famous Big Apple buildings for the web component of Doodle New York (by Puck/illustrated by Violet Lemay/2012). A handful of QR codes are sprinkled throughout Doodle New York, which are linked to downloadable coloring pages—several of which were drawn (with a blue ball-point pen!) 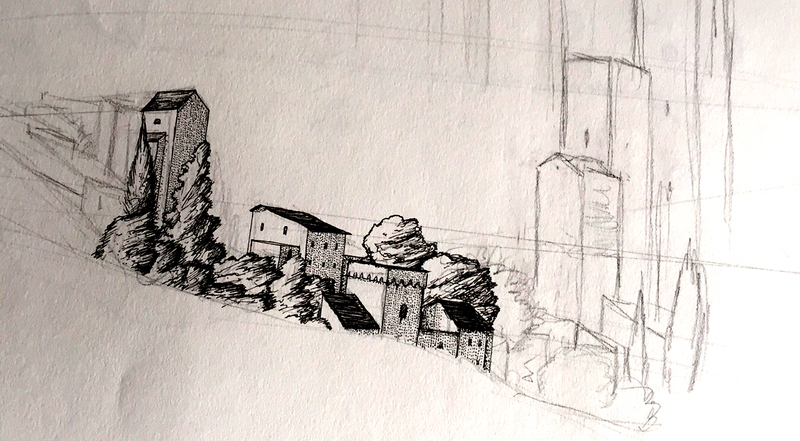 by Gray… whose professional name is Graham Fruisen. The coloring pages are still available, but you can only see them if you buy the book and scan the QR codes. 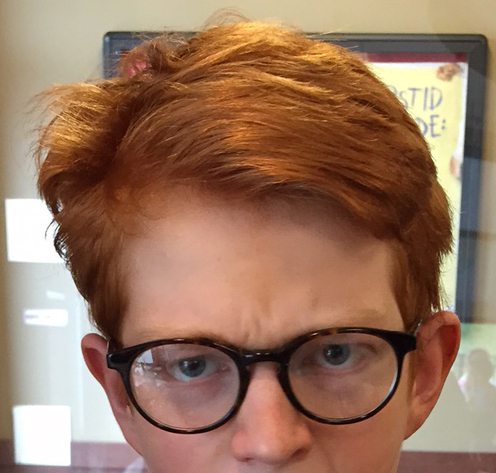 When you do, imagine a skinny, freckled, bespectacled teenager groaning with despair. “That is not my best work!” As soon as I read Mauricio’s manuscript for 100 PABLO PICASSOS, I knew I would enlist Gray’s help for the “Picasso as a boy” spread. The mom in me was excited because school was out for the summer, and I was looking stuff for Gray to do. I asked him to contribute drawings of donkeys, doves, and bulls—not Gray’s typical genre, but he was willing to dabble. My hope was that my new assistant would just draw them already! As a boy Picasso drew in a classic style, very similar to the way Gray tends to draw—but my son went the extra mile. He researched Picasso and did his best to draw donkeys, doves and bulls as he imagined Picasso (the grown up, world renowned artist) would have drawn them. The result (below) is beautiful, even if it isn’t exactly what I had in mind. But hey, this is what happens when illustrators pay their assistants with Little Debbie Swiss Rolls and blueberry freezes from the corner Quickie Mart. Our resulting collaboration, 100 Pablo Picassos, is newly available everywhere books are sold. Click here to order your copy today! And THANK YOU, Gray! You’ll always be my baby. Mama loves you, boy.